Spencer Normington’s music program looks different than most elementary music rooms. Students in K-5 music usually spend their class periods singing, learning a little theory, practicing rhythms or playing the recorder. Normington was a fourth-grade teacher when he took over the music classroom at the Ramsey Magnet School of Science in Coeur d’Alene 10 years ago. With wide latitude to design his own curriculum, Normington has aggressively sought grants to line the walls with guitars, clarinets, ukuleles and trumpets. The reed and brass instruments are mostly modern designs made of hard plastic, but they’re not toys. These modern instruments allow whole classes to learn to play band instruments at the same time, even though kids in Idaho usually don’t get band instruction until sixth grade. 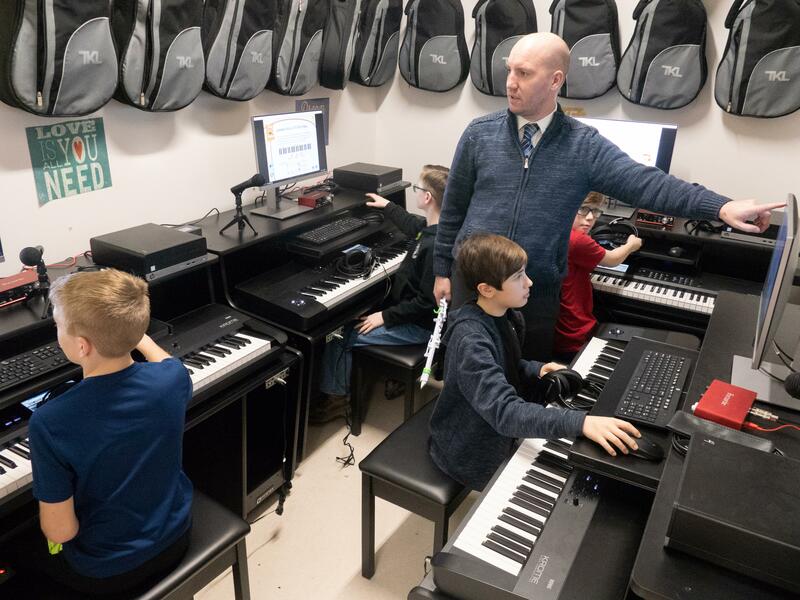 The latest addition to the classroom is a “piano lab,” which has eight stations with pianos and computers with teaching software. The lab was paid for by a grant of more than $48,000 from the Coeur d’Alene Tribe, which for many years has made educational grants to the Coeur d’Alene area schools from the profits of tribal businesses. The tribe also contributed $9,805 to purchase a rolling rack of Chromebook laptop computers for use in the classroom. With only eight stations in the piano lab, the instruction is limited to students who rotate in and out of the lab while others do regular group activities. The software offers 110 independent lessons, and students must show proficiency to the software before moving on to the next lesson. On a recent Thursday, eight students were using headphones while working on their piano lessons while the rest of the class was learning to play plastic saxophones. Normington can monitor the piano students from an iPad he carries around the classroom. “The biggest thing is the level of independence and taking ownership of their own learning. They can learn on their own, but I can also listen to them with my iPad, which is a level of accountability,” Normington said. He’s able to do that because of the grants he’s won from organizations like the EXCEL Foundation, Sunrise Rotary and Kootenai Electric. “Everything you see in here comes from outside (funding) sources,” he said of the dozens of instruments arranged in his room.